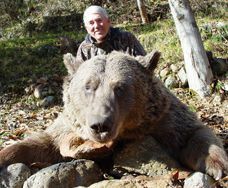 Brown Bear was hunted first time in Turkey many years ago and then the goverment closed the hunt although there are large amounts of animals disturbing and making many problems to the villagers in our hunting areas at the northern part of Turkey and some of them are at the central part of Turkey. Comparing to the same animals in Europe they have the same colors and same habits but bigger bodies then those ones. Although there are large amount of animals in our hunting areas,very few permits issue by the game department of Turkey(if issues).